MLB-E4205-12-P-F switch is a Managed 10/100M Gigabit Ethernet switch, providing 4/8 10/100/1000BaseT PoE PSE ports and 100/1000BaseSFP ports. 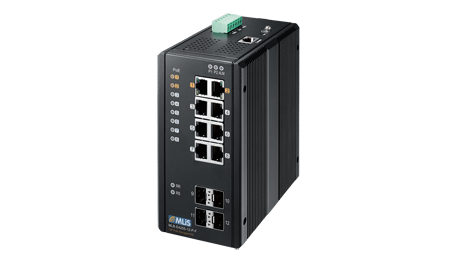 It complies to IEEE 802.3at standard and able to deliver up to 30 watts power per port along with data on standard Ethernet cabling. The switch can be used to power any IEEE 802.3af /at compliant PoE PD devices with PoE power management feature, which eases the deployment effort of planning PoE power budget and eliminates the need for additional wiring to reach power source.